Frederiksberg. The city is an municipal island surrounded by Copenhagen and with its 90,000 residents, it is Denmark's most densely-populated city. Generally, the city is good at providing for cycling and around 35% of the residents cycle to work or school. This is the city in which I live and where Copenhagenize Design Co. has it's offices. There are, however, problems that need solving and there is no solutions on the way. One of them is highlighted here in this article. Even though only 35% of the population of the city own cars (the number is 29% for Copenhagen), the main arteries are clogged with cars and trucks all through the day. Over 26,000 drive past my windows each day. Almost all of them are "parasites", as Italian traffic planners call them. 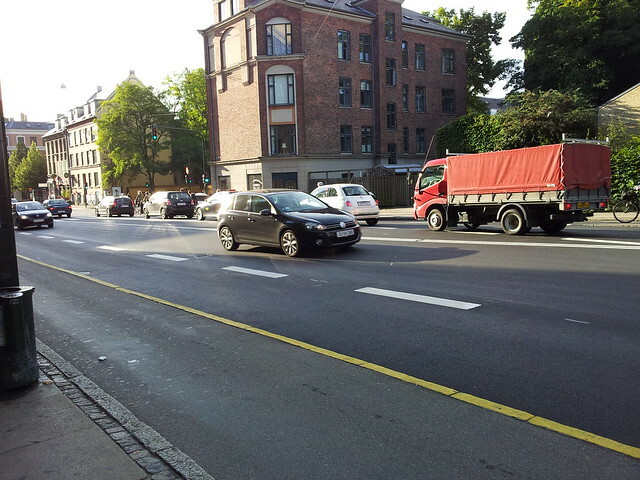 When I looked out the window at the intersection between Nordre Fasanvej and Godthåbsvej (above) I was pleased to see that work was underway on resurfacing the street. I don't give a toss if the car lanes are resurfaced or not, but I was sure that some intelligent, new century retrofitting would be a part of the work. If you look at the photo, above, you see a wide street with cycle tracks on either side. You also see wide car lanes. The resurfacing work was the prime opportunity to make the street better for cyclists and pedestrians. Much better. Unfortunately, as work progressed, I could see that nothing was being done for cyclists or pedestrians. At all. The stop line for cars is still pushed right up against the crosswalk. Hardly making crossing the street a pleasant experience for the many, many pedestrians on this corner. 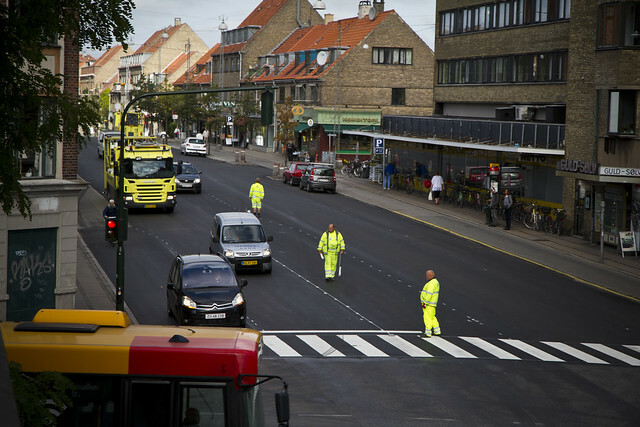 Nor was the stop line wasn't pushed back 5 metres, which is now the standard in Copenhagen, along with continuing the cycle track right up to the crosswalk. Unbelievable. If you ask the engineers responsible for this I'm quite sure they'll rattle off all manner of stats and computer model results about how many cars have to get through the intersection and how that five metres will affect this car flow... blah blah blah. They won't mention the human aspect in this intersection - one with great numbers of cyclists and pedestrians, including many children at nearby schools and kindergartens. I was also frightfully disappointed to see that, despite the wide street, the cycle tracks or sidewalks on the northern side weren't widened. Look at the above photo. That's a bus stop on the sidewalk. There is hardly any space for pedestrians to get past the bus stop sign and the building. Believe me, I know. I walk past every day heading home from the supermarket 50 metres further on. More often than not I have to walk out into the cycle track to get past. Walking a bike or a pram, especially laden with groceries, is a challenge at this unnecessarily inhuman bottleneck. Not fair to any pedestrian. Here's another view of the busstop. Even without the bicycles there, it's a tight squeeze when people are waiting there and others try to get past. It would have been an easy task to use the resurfacing work to widen the sidewalk and cycle track. There is more than enough room. Again, however, I'm sure the answer would be something like, "Oh, the resurfacing work has nothing to do with widening sidewalks. That's a different department and they're located on a different floor of the city hall." Or "That's a different budget... you can't mix the two different jobs or budget. That would be logical and cost-efficient". 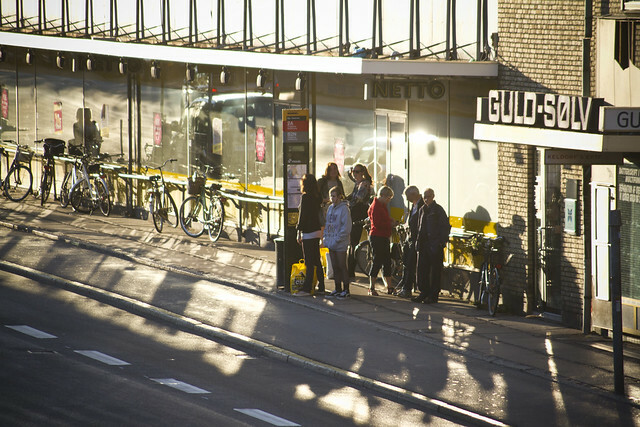 But perhaps Frederiksberg, a notoriously Conservative enclave, is going for gold. 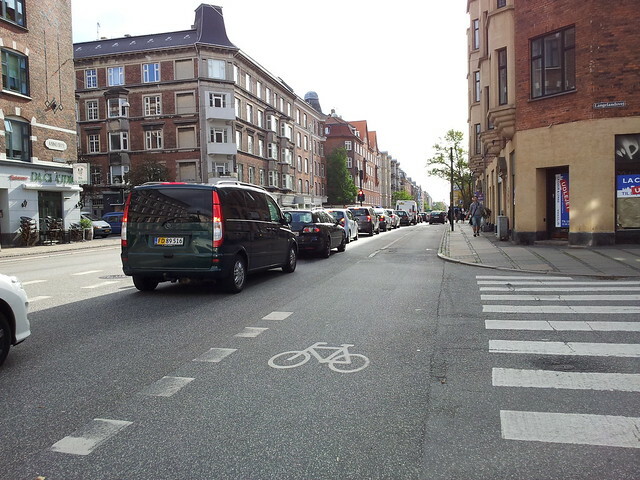 It looks like the resurfacing work has created a winning candidate for Denmark's Widest Urban Car Lane. And no... it's not 1952. It's 2012. Parasites involuntarily "parked" on my street. They don't live in my city, they just drive through. 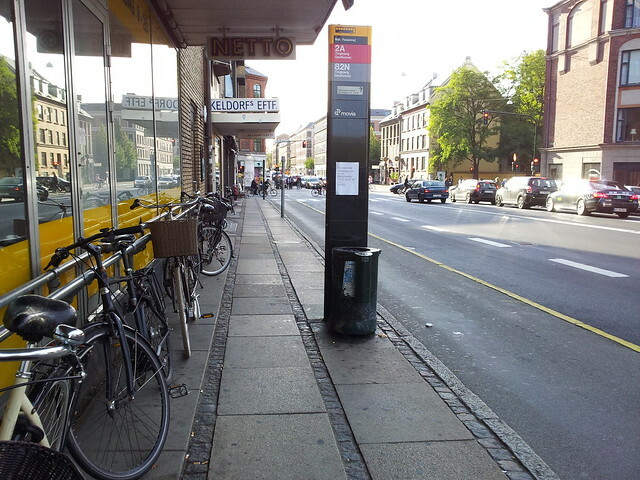 And the City of Frederiksberg doesn't seem to worried about that. The city is currently prostituting itself in the sleazy whorehouse of automobile culture, servicing the whims of an endless line of faceless motorized Johns. 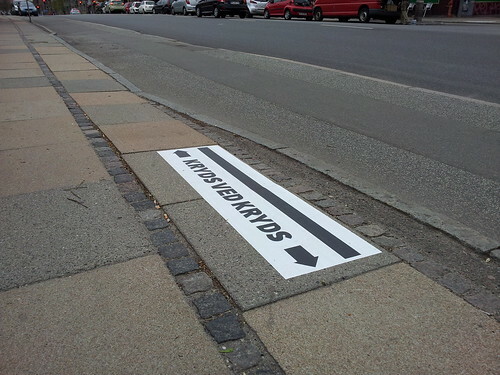 Ohh, here's an idea....What about a goal of making Frederiksberg Denmark's Greenest City? What about creating 30 km/h zones in the entire municipality? What about traffic calming these streets to send the cars back to the main arteries where they belong? That would be soooo 2012. Just saw this sticker on the sidewalk today. "Cross at the intersections". Right there across the street from the neighbourhood supermarket. With arrows pointing to intersections 200 metres to the left and 100 metres to the right. Unbelievable. Totally and completely Ignoring the Bull and getting away with it.